Be sure to invite your family, friends, and neighbors to join you for our Sunday morning worship on August 26th at 10:30 am in Pocahontas. There will only be one worship service this day, and a freewill offering will be taken for the Morgan’s that day in addition to our regular Sunday offering. 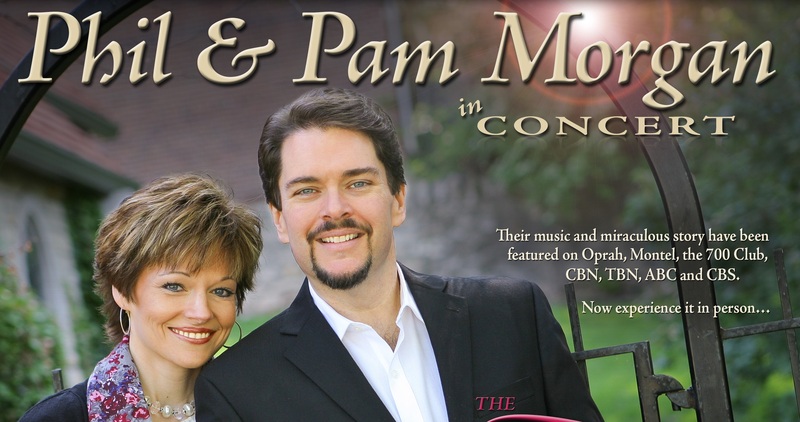 Gospel music recording artists Phil & Pam Morgan will sharing their national “AMEN” Ministry Tour. The couple’s message is summed up in their signature song, Take a Stand – a triumphant theme considering Pam was once told she would never stand on her own, much less walk again. The husband and wife team from Kansas City, MO began singing together full-time in 1996, but their ministry came to an abrupt halt Sunday afternoon, June 4th, 2000, when the couple’s van crashed into a bridge. Pam was thrown onto the roadside, suffering numerous injuries including a broken neck that left her completely paralyzed from the chest down. Top surgeons said she would never feel or move most of her body again. The couple immediately began a prayer chain from their PhilandPamMorgan.com website that soon circled the globe. Much to the doctor’s amazement, feeling and movement began to gradually return to Pam’s lifeless limbs. In one year she progressed from being wheelchair bound to walking unassisted. The specialists still have no explanation for Pam’s miraculous recovery, but the Morgan’s attribute her healing to the power of God. Exactly one year after the accident, Phil and Pam walked into a Nashville studio to record Living Proof. Phil, an award-winning songwriter, composed all the songs on that CD as well as many recordings that followed. You won’t want to miss this great music ministry! We “HOPE” to see you and your friends there!